​FaZe Clan wins BLAST Pro Series Miami! BLAST Pro Series Miami is over and FaZe Clan surprised everybody with an absolutely dominant performance throughout the tournament. 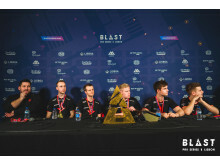 In FaZe Clan's first ever BLAST final, they beat Team Liquid 2-0 and became the first team to win BLAST Pro Series on US soil - and 125,000 US Dollars. Meamwhile Team Liquid takes the lead in the global BLAST Pro Series tournament. The finalists for BLAST Pro Series Miami have been found: Historic final coming up! The finalists of BLAST Pro Series Miami have been found. Home soil favorites Team Liquid are going head-to-head with FaZe Clan for the lion's share of the 250,000 dollar prize pool and the title of BLAST Pro Series champions for the first time in the US. Both teams have huge fan followings in the US, so everything is on the line in this thrilling grand final match-up. Round 1 and 2 of BLAST Pro Series Miami are done and the victors of the first day have been found. Team Liquid and Astralis tops the leaderboard going 2-0 in their opening matches. NAVI goes 1-1. FaZe Clan and MIBR both take 1 loss and 1 tie. Cloud9 ends the day on 0-2. The second tournament of the 2019 series is underway in Miami. Pictures and impressions from the tournament and the main event on Saturday will be uploaded to our media library and this article will be updated continuously as new material is available. All pictures are free for non-commercial, editorial use. ​BLAST Pro Series Miami, April 12-13, is right around the corner. Here is a compiled guide for the event answering any question you might have about: The teams and their players. Warowl and fl0m, who are they? The full program for BLAST Pro Series Miami. Tournament format, BLAST Stand-Off, and prize distribution. The six teams at BLAST Pro Series São Paulo have been fighting all day for the final spot. The old rivals, Astralis and Team Liquid stand tall and will battle for the title of BLAST Pro Series champions and 125,000 dollars. Astralis eased their way to the final, securing their final spot after going 5-0 in the group stage. Team Liquid went to the final in a nail biting match against ENCE. 7000 fans created an amazing atmostphere in Ginasio do Iburapuera and everybody got what they came for... Almost: World-Class Counter-Strike and a spectacle of a show, but no home team in the Grand Final. Nevertheless - the impressions from BLAST Pro Series Sao Paulo will last for a long time - just like the colorful BLAST murial on a city wall in the pulsating metropol. The first day of BLAST Pro Series São Paulo is over and the victors of round 1 and 2 have been found. Home soil favorites MIBR had a rocky start to the tournament going 0-2, while all other teams went 1-1 except for Astralis who ends the day at 2-0 after two very close games. In this article you will find some of the best pictures from BLAST Pro Series Sao Paulo as well as a link to all the pictures taken at the event - for free download and editorial use. BLAST Pro Series Sao Paulo - Stage Revealed! BLAST Pro Series Sao Paulo kicks off Friday night with the two first rounds of the group stage. Saturday the gates to Ipirapuera Arena will be completely packed for the spectacular event, the decisive group stage matches and the Grand Final. The iconic BLAST stage has just been revealed - and it is a real beauty that awaits the 7,000 fans in the audience! In less than 8 hours all 6,000 tickets for BLAST Pro Series São Paulo were sold out. Monday 600 extra tickets were released and again everything was sold out in only hours. The interest for BLAST in Brazil is overwhelming and more than 7,500 are still on the waiting list for the 2019 kick off of the global tournament series. On April 12-13 BLAST will debut in US with a tournament in Miami. It's almost time for BLAST Pro Series São Paulo, the kick off for the most exciting BLAST year yet. Whether you're watching the event on TV, on our online streams or if you're part of the live audience in the Ginásio do Ibirapuera arena, you want to know when and where the show goes down. Find the full programme here. BLAST Pro Series in São Paulo on March 22-23 and BLAST Pro Series Miami on April 12-13 will have six teams respectively, competing for the lion share of 250,000 dollars. All the teams are confirmed for attendance and in case you're not sure exactly what you're getting into, we've compiled an easily digestable summary of all the world class teams here. Sãu Paulo is the host city for the most exciting BLAST Pro Series year yet, 2019. Jordi Roig, Executive Producer for BLAST Pro Series: - The Counter-Strike Major is being played in Katowice these days and the BLAST teams coming to São Paulo have all advanced to the play-offs. That should tell you exactly how prestigious BLAST Pro Series São Paulo is going to be, Jordi Roig says. 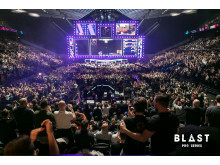 Jordi Roig, Executive Producer of BLAST Pro Series: - The show and format is groundbreaking in the booming world of esports. 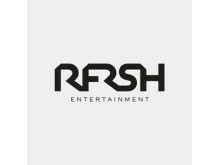 RFRSH Entertainment, who is behind BLAST Pro Series, has invested significantly in developing a new entertainment format to present world-class esports in a much more fun and engaging format than ever seen before. If the audience was to decide, there is probably no doubt who should win the "Event of the year" Award in Portugal. The atmosphere in the sold out Altice Arena was electric even for BLAST standards and the spectacle on stage was out of this world. This being said, 2018 was an amazing year of esports in Portugal and the competition is fierce. Winners will be announced on 2 March 2019. BLAST Pro Series Sao Paulo will be the biggest esports event in Brazil in 2019 and the tournament is expected to break the boundaries for live esports entertainment. The biggest stars of Counter-Strike will battle it out live on the iconic BLAST stage in front of a completely packed arena with more than 6,000 fans! Less than 24 hours after opening the ticket sales the arena was sold out! The accreditation process for the biggest and most entertaining Counter-Strike tournament on Brazilian ground in 2019 is now open. We look forward to welcoming working journalists, photographers and other media representatives for the main event in São Paulo on Saturday 23th March. Note: Only working media representatives will be considered for accreditation.